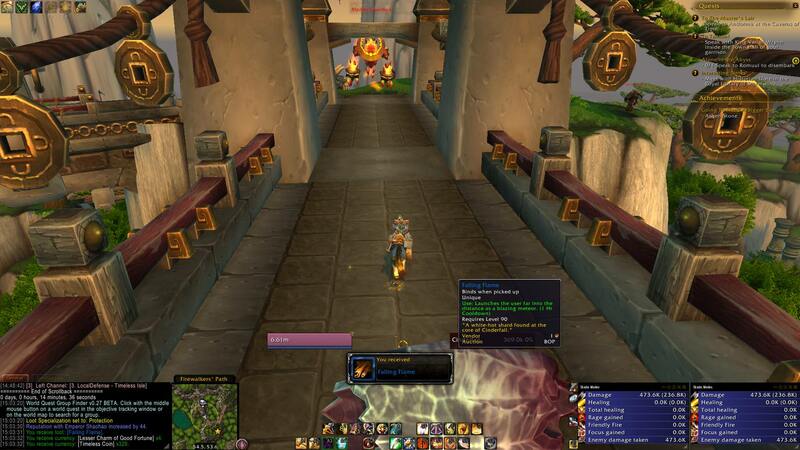 This is a rare NPC standing on the bridge leading to the world boss Ordos. This guy is damn near impossible to solo as a melee class without a constant speed boost. His 360 AoE ability will almost always hit you unless you are already out of melee range of him. Put your pet into Tenacity spec. Misdirection onto pet and stand at max range away from Cinderfall and stand on the side of the path. Control pet to have it attack first BEFORE you attack and misdirect. Your pet will not even need to be mended that often because they have a damage reduction to AOE attacks (Avoidance) which is the only thing these types of elementals can do on the isle. When Cinderfall casts the ranged Molten Inferno line at you, step to the opposite side of the path. You do not even have to move more than 2 yards to avoid the line. Keep this up and all you have to do is wait till your attacks kill him. I solo'd this rare many times as a Marksman Hunter and this same method applies to the Molten Guardian. His name in Kalimag means "LOLmelee." can drop Falling Flame i have yet to get it. but the info from some of the videos i have watched its a must have. will launch you across the timeless isle and more. only prob with the item is that it has 50 charges silly for its low drop rate and the CD. ps: i yell cinderfail in the general chat when he spawns. As a warlock, just send in your Voidwalker/lord and he will barely take any damage while you kill him from afar. Glyphed Health Funnel was enough to keep the my voidwalker alive, only thing to watch out for is those long range line aoe that might get to your range, but they are easy to dodge. This NPC is a great lesson in how to exclude melee from the fight. His cheap instant kill 2 second cast mechanics completely exclude melee from being able to participate. If you're not a ranged class, either stand back or enjoy your graveyard runs. A note for the many who stand off to the side while fighting this guy: watch out for pets that are sent to tank in a specific spot, especially if there's a hunter or warlock standing right in the middle of the bridge, because it means Cinder will end up pointed to one side or the other. Easiest way to check is to see where Molten Inferno is aimed, but of course you only have a split second to move. Confirmed twice, Cauterizing Core drops from Cinderfall in addition to the molten guardians. Didn't see it on the loot list so I thought I'd post this here. Anyone else have issues with his attacks having a wider hit box than the animation suggests? There's been more than a few times when a group of range would be standing on side of the bridge with his long line attack all the way on the other side, a good 5-10 yards away, and it would still nuke all of us. Or trying to melee on my monk, and roll away outside the ground animation when he starts casting, only to get hit anyway, standing well outside of the supposed damage area. I have pretty good internet, and rarely have any problems with latency, and like I said, it hit a whole group of us who thought we were safe, so this seems to happen to more than just me. Cinderfall; like a wrecking ball. First, as a Hunter/Warlock, have your pet move to the side of Cinderfall BEFORE attacking. Doing this simple trick will make Cinderfall only attack sideways, so the only real threat is the 360 degree attack. So even melee classes can get in on the action with their ranged abilities and spells as long as they stay out of range of the 360 attack. Once the mob at the head of the bridge is killed. Target Cinderfall asap. Proceed toward Cinderfall with caution. When your attacks turn white you've became within "kill range". You want to be just close enough to get a shot off, NO FURTHER. It maybe a good idea to move a bit closer with small steps, 1 or 2, then tap your "back key" until your shots are red and then 1 or 2 small taps forward until white again. This will make sure you're just close enough to get shots off. You can never be too careful because his ground fire will usually kill a Hunter in 1-2 hits. Now you're in position. Cinder's ground fire WILL NOT HIT YOU. So don't panic if you see the fire at your feet. I spam "Kill Command" which will send your pet in for the attack. I use "Kill Command" because once close enough, "Kill Command" will do considerable amount of damage, which will pretty much give your pet instant aggression without hoping for a taunt. Because we don't want Cinder to move an inch from his spawn location. DO NOT go into popping cooldowns. Stay calm. Your pet WILL NOT lose aggression. Stop your auto attacks. Your main attacks will be "Kill Command" ( Every time it's cool ), "Serpent Sting" ( Keep it on Cinder either with 1 "Cobra Shot" or just by reapplying ), "Arcane Shot" ( Shoot 1 or 2 times just after every "Kill Command" ) and finally keep your "Focus Fire" hot. Never wait until it's on a "5 stack". Even at < 1 >, use. You won't have to heal your pet much at all but don't let your pet's health points get down pass 1/4. You WILL notice that your "Pet Mend" will go in and out of range. Again, don't panic. You'll have plenty of time to heal him. My primary choice of a soloing pet is Loque'nahak. ( Spirit Beast ) I like using Spirit Beasts because of their "Spiritual Mend". I keep it OFF PASSIVE so I can heal myself when need be. It helps save "Focus" that he could be using on something else. I have soloed Cinderfall many times using this attack style with 0% failure. Failure has only occurred when someone comes along and taunts him and Cinder moves. Hope this has helped a few Beast Master Hunters understand my style of soloing Cinderfall. My way takes a little bit of time to kill but flawless. 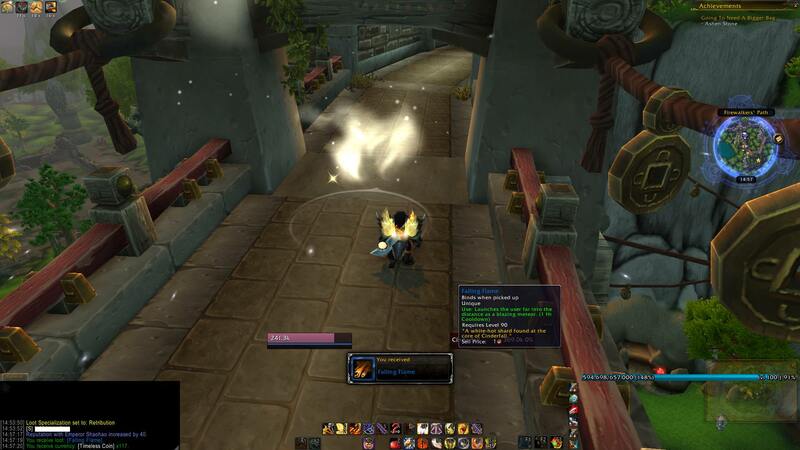 Monks who take Celerity as their first talent tier can tank this guy by rolling out of his melee AOE. ... as long as you have a good enough connection and much better eye-hand coordination than I do. Cinder Fall is on the Timeless Isle? Perhaps Mercury and Emerald are also nearby, and possibly Roman. Been farming Cinderfall for quite some time now in hopes of Falling Flame drop for Going To Need A Bigger Bag achievement. As Hunter you can easily solo him by staying out of the range of his Molten Inferno spells by letting the pet tank. Even with ferocity pet it's not really a problem, just throw in a Mend Pet every once in a while. But the fight can be quite long and annoying at times. Especially when you are seemingly the only ranged DPS around. Everybody else is melee and they just come there to hit him once, then they pull back. Suddenly you notice that Cinderfalls health has scaled up to 36 million or more and you are pretty much the only one making any damage on him. They must have removed the falling flame from this mob killed Cinderfall over 1000 times on all my alts and never had it drop. And people sitting h me have never seen it drop either. This NPC can be found in Timeless Isle (4).